Comedians John Roy (Star Search, Multiple Late Night Appearances) and Andrew DeWitt (Sundance, Showtime, TV Land and Jimmy Kimmel) nerd out about what drew them into Warhammer: Age of Sigmar, Games Workshop modeling and their philosophies on gaming. Listen to two comedians banter about the state of their favorite game, the kinds of games they like to play, the people they like to play with and the models they love. NSFW language so wear headphones if your boss is around. On this episode of Legends of The Painty Men, comedians John Roy (Star Search) and Andrew DeWitt (Jimmy Kimmel) send up their favorite table top game: Warhmammer: Age Of Sigmar. On this episode Andrew talks about his new NSFW Slaanesh army, John debates the arms race of adding Stormcast Ballistas to his list and they uncover a consipiracy by Gamesworkshop to force us to spill paint. Enjoy! Comedians John Roy (Star Search) and Andrew DeWitt (Kimmel, Sundance) are back again with more irreverent takes on their favorite table top game Warhammer: Age Of Sigmar! This episode they talk about Gloomspite Gits, the vuloptious Troggoth Hag and get some cool naughty bits from Mierce Miniatures witch disgust John Roy and Thrill Andrew DeWitt. Join in the fun! With hot troll BUNS! Disclaimer! This episode had to be recorded on Andrew's cell phone due to technical difficulties. It's listenable but lower quality than we'd like. The issue has been resolved and we'll be back with better stuff soon! It's a funny as hell episode where we (comedians John Roy and Andrew DeWitt) talk about Daughters of Khaine, Taco Bell, gaming stories of yore and more. Comedians John Roy and Andrew DeWitt riff on their favorite table top game: Age Of Sigmar. This episode they talk about what Ironweld Arsenal looks like to regular people and Andrew makes an idiotic promise to add in sound effects. Sound effects Free Sound Project. Comedians John Roy and Andrew DeWitt riff on and skewer their favorite tabletop game, Age Of Sigmar with insane bits and nerdy tangents. On this episode, they talk about the best way to fix meta-gaming forever and also explain Slaanesh to people who've never touched dice before. 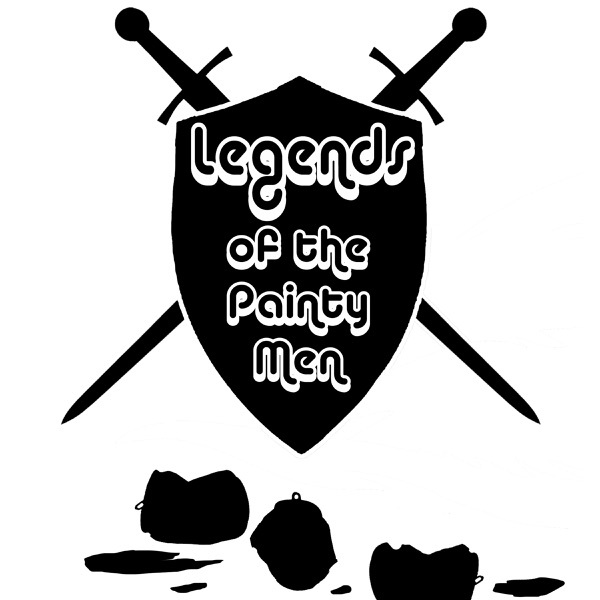 Legends Of The Painty Men Episode 8: Andrew Actually Plays Age Of Sigmar Skirmish! Comedians John Roy (5 Stars on Star Search, Google it!) and Andrew DeWitt (Sundance, Jimmy Kimmel, TV Land) join forces to talk and riff on their favorite hobby of all time: Gamesworkshop's Warhammer: Age of Sigmar. In this episode, Andrew confesses to John how much he loves Hero Quest furniture, one of them actually plays AoS Skirmish and loves it and they read more listener comments! Los Angeles comedians John Roy (Star Search, Late Night TV) and Andrew DeWitt (Sundance, Action Figure Therapy, Kimmel, TV Land) join forces to geek out and roast their favorite game: Age Of Sigmar. This episode they talk about how crazy Flesh Eater Courts are, the cost difference between Dungeons and Dragons and Age of Sigmar, John tries out a Storm Cast Eternals "Wall" and Andrew shares an embarrassing story about creating his own monster stat sheet. NSFW language so use headphones if the boss is around! Los Angeles Comics John Roy (Late Night, Star Search) and Andrew DeWitt (Sundance, Jimmy Kimmel) riff on their favorite tabletop game, Age of Sigmar. This episode they talk about what Beastmen look like to normal people who don't play Warhammer, read some fan reviews, talk about how many flintlock pistols the Inquisitor has and send up Age of Sigmar: Skirmish. We get NSFW with our potty mouths so pop those headphones on, y'all. Comedians John Roy (Star Search 5 Star Stand Up Comic, Copious Late Night TV Appearances) and Andrew DeWitt (Sundance, Jimmy Kimmel, Action Figure Therapy) join forces once again for more NSFW irreverent humor about Age Of Sigmar. This episode they talk about grimdark fantasy body odor, the drawbacks of working in an office where you paint miniatures for a living, what Beastclaw Raiders look like to normal people, and they celebrate a 1000 listeners. Listen and share with your nerdiest friends. Comedians John Roy (Star Search, Multiple Late Night Appearances) and Andrew DeWitt (Sundance, Showtime, TV Land and Jimmy Kimmel) send up their favorite tabletop game: Age Of Sigmar with bits riffs and real talk about the hobby. They take fan questions, read some reviews, recap a game of Daughters of Khaine vs. Stormcast Eternals, Fat Tzneetch Worshippers, and what Kharadron Overlords would look like to normal people. NSFW language so wear headphones if your boss is around. Legends of The Painty Men Episode 003: What Deepkin Look Like To Normal People, Coffee Ground Basing, Daughters of Khaine vs. Khorne And More! Comedians John Roy (Star Search, Multiple Late Night Appearances) and Andrew DeWitt (Sundance, Showtime, TV Land and Jimmy Kimmel) send up their favorite tabletop game: Age Of Sigmar with bits riffs and real talk about the hobby. They talk hooking up with Melusai, what Deepkin look like to normal people, homicide detectives in Age of Sigmar, Daughters of Khaine vs. Khorne, and more! NSFW language so wear headphones if your boss is around. Comedians John Roy (Star Search, Multiple Late Night Appearances) and Andrew DeWitt (Sundance, Showtime, TV Land and Jimmy Kimmel) recap a recent game of Triumph and Treachery, talk AoS 2.0, New Nighthaunt Models and working with Green Stuff. NSFW language so wear headphones if your boss is around.